I know that I have been promising some updates to the house and I finally have one to share. We have been very busy doing stuff around the house and have gotten quite a bit done but I don’t feel that anything is 100% yet. It’s getting closer though. Shortly after moving in, our microwave went on the fritz. It worked fine except the buttons were really hard to push and we often times had to use a kitchen tool to actually get the button to work. We filed a claim with the home warranty company and they came out to take a look (for $75). We were told a part would have to be ordered and they left. A few days later we get a call stating that our claim has been declined because it was a preexisting condition. Of course this made me furious because it was not a preexisting condition. It was not found to be a problem on the home inspection and the home warranty company did not come out and do their own inspection. After some haggling and assistance from our awesome real estate agent, they agreed that it should be covered and they offered us either a new white microwave or the cash equivalent to purchase our own. We opted to purchase our own so we could go with a new color scheme – stainless steel baby! 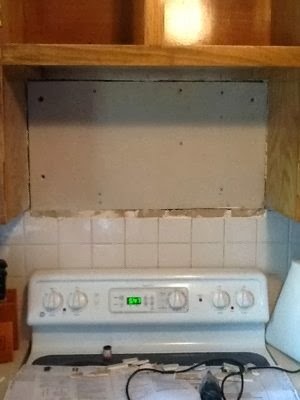 After removing the old micro, and putting up the template for the new one, I noticed that the tile back-splash was too high. I had the option to either remove the top layer of tile and hope that we will soon be redoing the entire back-splash or try and cut it. I opted for option number 2 and attempted to cut the tile without breaking it. My first attempt was with my dremel. I even ran to Home Depot and purchased a “special” tile cutting bit. Piece….of…..crap. I wouldn’t say the special bit didn’t work, it’s just that it worked very slowly. I figured I would have been there all day and my line would have looked like it was done by a 2 year old. I then remembered that I had a special diamond encrusted saw blade in the garage for a tile job I did many years ago. I ran out there and installed it onto my circular saw. The saw combined with a vacuum for easy dust free cleanup and I was able to cut out the line in record time. In addition, I only got the vacuum hose caught up in the saw twice! At least it wasn’t my fingers! After the tile was cut, I put the new template back on the wall and everything lined up perfect. I drilled new holes in the top for the bolts and a new larger hole for the power cord. A quick lift into place and I had it installed. 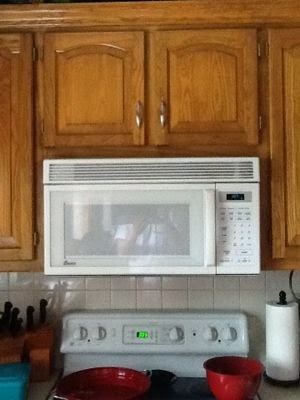 I really only have one more thing to do and that is to move the power outlet to a spot above the microwave. 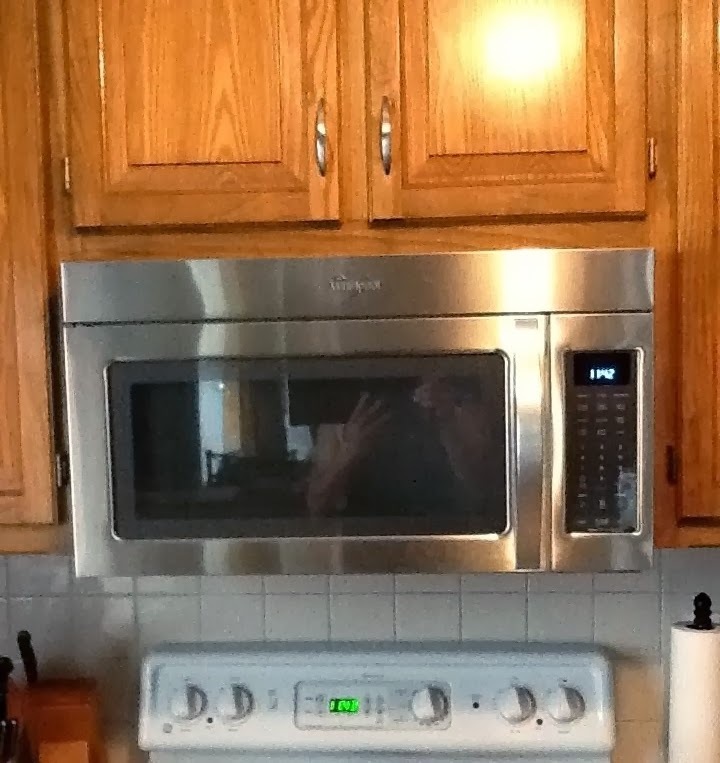 This house is about 20 years old and when built there must not have been any thought that someone would want a microwave above the stove. Currently the power chord is plugged into a power strip that runs down to an outlet below the cabinet and to the right of the stove. Not the prettiest thing but it works for now. So there you have it. My first official progress post on the new house.